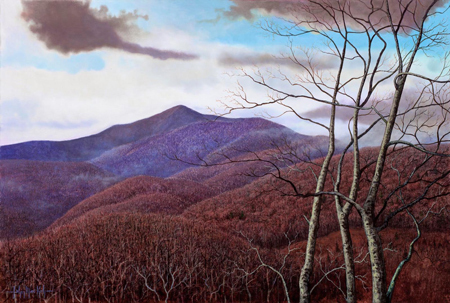 Cold Mountain, Spring was completed in the winter of 2004 and finished just as the trees began to bud out. Some species take on a peculiar red-brown tone in certain light. Later as leaves emerge, they gray and turn green. Maples are particularly vibrant, deep red and take on this color early as they produce blooms. Some trees’ are actually as colorful at this time of year as in fall, but its subtle and the season short, more ephemeral. It is very hard to capture in paint, by the time you notice and get started, the effect is gone. Available as an archival reproduction, 20 x 30″ on canvas or paper. The original is in a private collection. This entry was posted in Landscape, Paintings by John Mac Kah (JMK Studio236). Bookmark the permalink.